We are truly talking ‘beachside’ at the Avra as it commands a very enviable position right on Lindos’ main sandy beach. Inevitably, this popular part of Lindos gets quite busy during the day with boat trips and other activity on the beach. We arrived at Rhodes airport late hailed a taxi asked the price - £60.00 and headed for Lindos at warp factor 3 or was it 4, as we arrived the sun was rising so we went to the beach to look absolutely beautiful. We had the 2 rooms by the toilets, sounds gross but for what we paid great value for money basic rooms great air con £50.00 a week but you need it, my god do you need it! The maid came every day really nice lady very efficient. All the restaurants served good food at a good price and the beer was very cold. Would i go back again? No seen it, done it, move on. But we will look back at the Avra with good memories sitting there with dad and saying to the bathers toilets are on the left ! My two sisters and i stayed at the avra studios in lindos in June. The development is situated in an amazing position within yards of the beach, and the apartments where ideally located with superb views. However, anyone considering staying at the studios which are for 2/3 persons should beware. Whilst they are also located very close to the beach, the outlook from the studios is absolutely appalling. The rooms face onto a high wall, behind which is located the toilets belonging to the adjoining taverna. The patio areas are scruffy, dirty and depressing. To gain access to the rooms it is necessary to cross an area of sand and weeds, which is used as a toilet by the resident cats an dogs. At night, it is extremely dangerous as their are no lights whatsoever outside, and this is a serious accident just waiting to happen. We have just returned from Rhodes where we stayed at the Avra apartments. We were a bit concerned as the reviews were mixed. We were really surprised and found they were wonderful, they were clean, perfect beach location, we really could not find anything not to be happy about. If you are looking for a beach holiday in a typical Greek studio/apartment you will not go wrong choosing these. Obviously if you are looking for 5 star luxury book elsewhere!! This was our 4th visit to Lindos and these were by far the best we have booked. We had a 3 bedded studio overlooking the bay - perfect!!! We have stayed at the Avra Appartments for our holidays for the past 5 years. Although it is basic the location is perfect for a beach holiday and you are within easy reach of the main village/shops etc. There are a couple of bars/restuarants on the beach front which serve great food all day. Panos is highky recommended - good service and always friendly. Pleasantly surprised by these studios. We had no.6 and I think 6 to 10 are the best for views etc. One apartment (not sure of number) would not be advisable as right next to kitchen of taverna with loud air con. Basic, but cleaned every day. The location is second to none as you have the beach on your doorstep and great views of the acropolis and old town. Would recommend to anyone. Although we have been to Lindos many times this was our first time at the avra studios. It is typical of Lindos village accommodation, very basic but the location was brilliant for a beach holiday. It was 20 seconds from the beach and at night very peaceful. We are soon to book again for next year and will hopefully return to the avra. 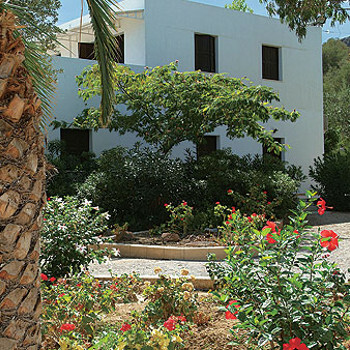 We have stayed at Lindos Avra apartments every year for the last 7 years. We love Lindos and has we take my 8 year old grandaughther with us every year, she loves playing on the beach and is happy to stay there all day. In the evenings we go up to town and enjoy the nightlife and the food. All the locals know us know because of our regular visits, all the locals are the friendlist people, we would reccomend Lindos Avra to anyone who loves the beach you could nearly fall out of bed and land in the sea, we have always found avra clean and presentable, see you on July 5th 08 at the Lindos Avra. I stayed at the Avra Appartments. Spot on location, very basic but perfect for mixing a relaxing holiday with the high life if you wanted it. The Avra apartments are in an ideal location if you are looking for a relaxing beach holiday. The apartments are a 30 second walk from Lindos main beach. The apartments themselves are basic but equipped with everything you will need for a self catering holiday, beds, WC, shower along with a small kitchen area and dining table. Our apartment also had its own private balcony with patio furniture. All apartments are fitted with air conditioning but this is at an extra cost and is fairly expensive and not really needed. If are you looking to spend all day on the beach then this is the end of Lindos you need to be staying as the main town is a ten minute walk uphill which is best only attempted in the evenings due to the heat. You will also find it pleasant in the evening as most people return uphill to the town leaving the apartment area quiet for sleeping. An ideal place to stay for family's or couples looking for a relaxed and easy beach holiday. If you want a lively place to stay then choose accommodation in Lindos town itself.